Jenifer Rubio Magnieto studied chemistry at the University Jaume I of Castellon (Spain). She obtained a PhD from the same university in 2011 under the supervision of Prof. Santiago V. Luis Lafuente on the ‘Pseudopeptidic abiotic receptors able to participate in self-assembling and self-association processes’. In February 2012, she has joined the Mons group, as a Postdoctoral fellow. 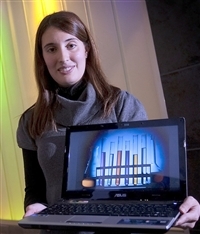 Her work deals with the spectroscopic study of DNA-conjugated polymers. Her research interests lie amongst others in the area of Supramolecular Chemistry, Pseudopeptidic and polymers compounds, Synthetic Organic Chemistry, Synthesis of Biologically Active Compounds, Synthesis of Natural Products, Bioorganic Chemistry, Combinatorial chemistry & Protein Synthesis, New nanostructures (desing and recognition). Chem. Commun., 2012, 48, 2210-2212. Soft. Matter, 2011, 7, 10737-10748.